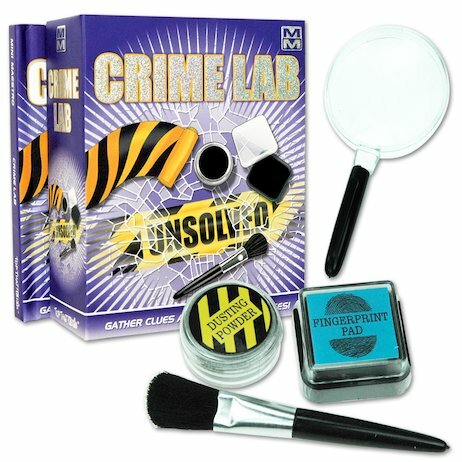 No crime’s too tough to crack with this cool sleuthing kit where YOU solve each baffling case yourself! Open the box and get sleuthing with all the cool gadgets a top investigator needs. Grab your case files manual, fingerprint kit and a magnifying glass that lets you detect even the tiniest crumbs of evidence. Inspect the crime scene. Find the clues. Nail your suspect! This kit contains all the crime-busting tools you need, including a 48-page hardback book, fingerprint powder, a dusting brush, an inkpad and a magnifying glass. This book is really a joy. I could find out whoever took my things by using the Crime Lab : unsolved. It makes other people not want to take things from me and I can also match the finger prints.No crime’s too tough to crack with this cool sleuthing kit where YOU solve each baffling case yourself. Open the box and get sleuthing with your case files manual, fingerprint kit and magnifying glass. Inspect the crime scene. Find the clues. 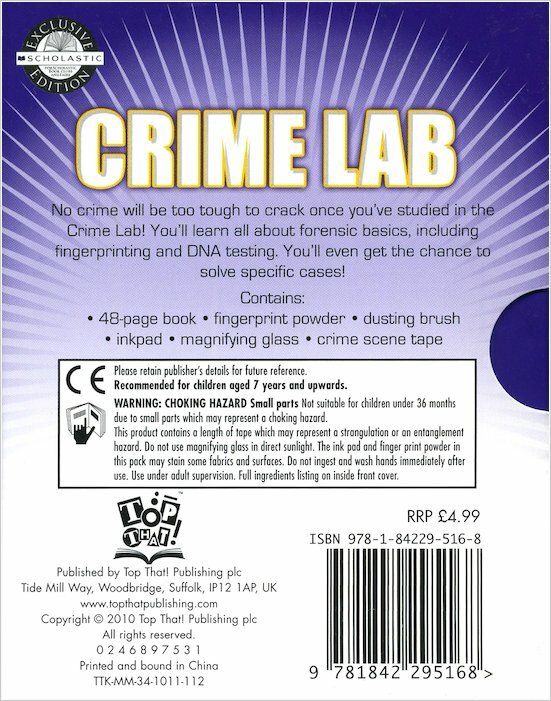 Nail your suspect!This kit contains all the crime-busting tools you need, including a 48-page hardback book, fingerprint powder, a dusting brush, an inkpad and a magnifying glass. All of the things that are included in this book are nice and easy to use. This book was so cool!I absolutely loved it. it was awsome i could find out secrets.